Don Gregory is truly a stallion of special class who unites in an exemplary fashion the inherited characteristics of DLG champion, Donnerhall, with the Graphit bloodlines so popular with breeders. 1991 Main Premium Reserve Champion. Don Gregory has earned 11,974 € so far by winning and placing in various tests up to Grand Prix free-style. On the basis of his licensed sons, Champion stallions, State Premium, Brilliantring and Champion mares, top auction horses, Bundeschampions and World Champions, Don Gregory is considered another trademark stallion. Most successful off-spring: Day Dream, licensed performance test winner in Medingen in 1996 and successful in advanced level dressage as well as his sons, Don Rubino and Dario Fo. His best daughters were Dark Dream (1998 Reserve Champion Mare in Rastede) and Ferdonia (2002 Champion Mare in Rastede, as well as Donna Gina (Champion of the Oldenburg Horse Breeders Society prize in Devon/USA). His son, Don Davidoff, was the Bundeschampion of three and five year olds as well as the 2002 World Champion of five year old dressage horses. The auction horse, Don Rubino, qualified for the finals in the 2003 Nürnberg Burg Pokal. 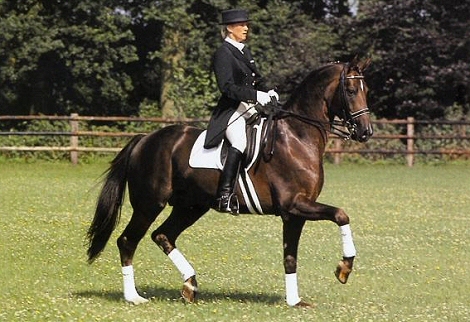 At the 2003 Bundeschampionat for six year old dressage horses in Sweden, Don Gregory's son, Don Charly, became Vice Champion. 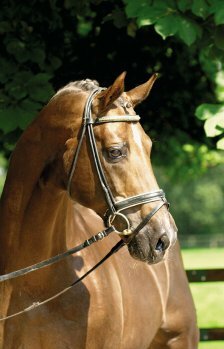 His daughter, Destination, became Vice Bundeschampion of five year old dressage horses and was the highest priced horse at the 60th Elite Auction in Vechta 2004. Don Ruto (Don Gregory-Rubinstein) was the 2005 NRPS Champion in the Netherlands. Don Giovanni (Don Gregory Rubinstein) was sold for 78,000 €, the 3rd most expensive riding horse at the Vechta auction. Licensed for Bavaria, Baden-Württemberg, Hanover, Hessia, Oldenburg, Rhineland, Westphalia and Switzerland.